If you’re thinking of installing hardwood flooring in your kitchen, you should definitely make sure you do your research. Hardwood flooring is a fantastic choice for your home. It is hypoallergenic, and extremely versatile as far as design goes. However, if you’re thinking of installing hardwood flooring in your kitchen, you should definitely make sure you do your research. Here are a couple of the pros and cons of installing hardwood flooring in your kitchen. There’s no denying that hardwood is the best-looking type of flooring on the market. After all, it has been one of the most popular flooring materials for a couple hundred years! It is also incredibly versatile. Whether your kitchen’s design is cozy, modern, rustic, or somewhere in between, you will be able to find hardwood flooring to match it. Unfortunately, hardwood flooring is also easily damaged by moisture. In your kitchen, accidents happen and they often involve some sort of liquid on the floor. If you don’t totally get rid of any moisture on the floor right away, you can damage your floor. Many appliances use water in order to function, so you would have to keep an extremely close eye out for any leaks or excess condensation. Quality hardwood flooring that has been correctly installed in your kitchen can actually increase the value of your home. Other types of kitchen flooring such as tile or vinyl won’t necessarily do that. From a selling standpoint, buyers are looking for hardwood flooring in homes that they look at and are willing to pay a bit more for homes with more hardwood flooring. 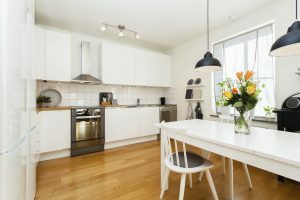 Depending on the type of hardwood flooring you choose for your kitchen, it may not be as cost-effective as some other options. You probably won’t spend as much up front for other choices, but you also won’t increase your home’s value. This entry was posted on Friday, November 3rd, 2017 at 11:01 am. Both comments and pings are currently closed.